Stephanie received her Bachelors of Science Degree in Communication Disorders from Bowling Green State University and her Masters of Arts Degree in Audiology from The Ohio State University. She has been a member of the DeVore, Katz Michaelson ENT family since 2004. 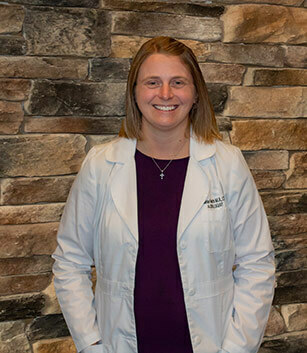 Stephanie is certified by the American Speech Language and Hearing Association, a fellow of the American Academy of Audiology and is licensed to practice Audiology in the state of Ohio. She also has been a member of the Ohio Academy of Audiology and has served on the Planning Committee for the Biennial Ohio Academy Conference (OAC). Stephanie has been a clinical site supervisor and mentor for University of Cincinnati graduate students. Stephanie and her husband, Nick, reside in Beavercreek with their two children. She is an active member of her church where she teaches Sunday school and is involved with the youth board. She spends most evenings attending her children’s sporting, dance and choir events. Stephanie enjoys reading, scrapbooking and traveling with her family.